Akash is currently on the board of Reliance Jio while Shloka is a Director with Rosy Blue Foundation, also a co-founder of ConnectFor, an organisation that helps NGOs get volunteers for various causes. 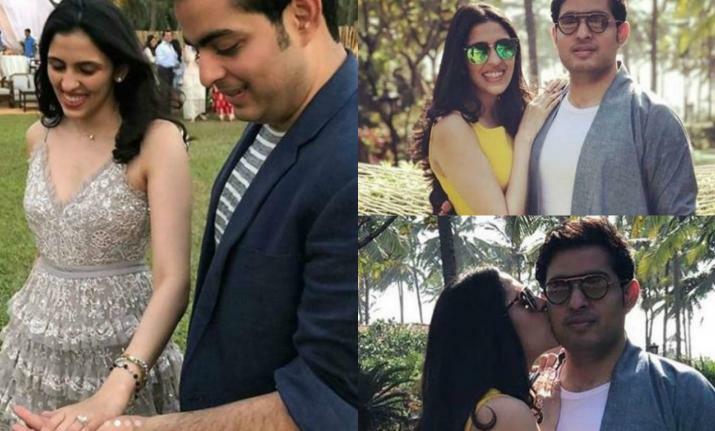 The dazzling duo Akash Ambani and Shloka Mehta are all set to get hitched this December following his proposal to the lovely lady at a plush five-star resort in Goa on Saturday. Akash is the son of India's richest man Mukesh Ambani while Shloka is the daughter of diamantaire Russel Mehta and Mona Mehta, who own Rosy Blue Diamonds. She has known the Ambanis since she was four. Akash is currently on the board of Reliance Jio and Shloka is a Director with Rosy Blue Foundation, also a co-founder of ConnectFor, an organisation that helps NGOs get volunteers for various causes. Interestingly, Akash and Shloka both studied together at Dhirubhai Ambani International School (DAIS), in the Bandra Kurla Complex in Mumbai. Akash pursued his further studies at Brown University, a private Ivy League institution based in Rhode Island and Shloka left for the US to study anthropology at Princeton University. She later completed her Masters in Law from the London School of Economics and Political Science. Shloka lives with her family in South Mumbai. She has two sisters and is the youngest daughter of the Mehtas. Meanwhile, Akash has a twin sister Isha and a younger brother Anant. Akash proposed to Shloka on March 24, however, a formal engagement ceremony is yet to happen. If reports are to be believed, the two will tie the knot later this year after their engagement in June. Both Akash and Shloka bear powerful business backgrounds. Akash is born to Nita Ambani and Mukesh Ambani, who chairs and runs $51 billion (revenues) oil and gas giant Reliance Industries, among India's most valuable companies. In 2016, Reliance sparked a price war in India's hyper-competitive telecom market with the launch of 4G phone service Jio. Jio has signed on 160 million customers by offering free domestic voice calls, dirt-cheap data services and virtually free smartphones. Nita Ambani is a philanthropist, a business owner and the owner of the Mumbai Indians cricket team. Her love for her family had kept her grounded and focused. But not many know that she had quite a modest beginning and hailed from a middle-class family in surburban Mumbai. Nita Ambani has an undergraduate degree in Commerce from Narsee Monjee (NM) College of Commerce and Economics and had taken up a job as a school teacher when she crossed paths with Ambani family. Shloka is born to Mona Mehta and Russell Mehta, who is the managing director of Rosy Blue Diamonds, which is ranked as one of the world’s top diamantaires. Rosy Blue started trading as “B Arunkumar” more than 50 years ago and now it boasts its presence in 12 countries around the globe. Russell who lives in south Mumbai, is the son of Arunkumar Ramniklal M, one of the co-founders of B. Arunkumar & Co, way back in 1960 in Opera House, Mumbai’s hub of diamond business. Global Inter Gold, the jewellery manufacturing unit of Rosy Blue India, is one of the leading diamond jewellery companies in the world. Orra is the retail chain of Rosy Blue India. Rosy Blue became a member of the Responsible Jewellery Council- a not-for-profit, standards setting and certification organisation, in 2011. In May 2017 in Bahrain, their youngest daughter Divya Mehta married Ayush Jatia, son of Amit Jatia who holds the McDonald's franchise for the west and south of India through his company, Hardcastle Restaurants.